Before leaving for Subic, we had a sumptuous Italian meal at C’ Italian Dining in Angeles. Chef Chris mans the kitchen, whipping up pasta sauces to match every craving and taste. 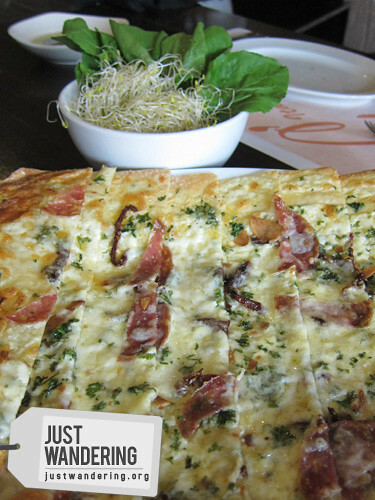 The best seller though, was his original creation: the Panizza. Soft thin crust pizza that you top with arugula and alfafa sprouts then rolled like Japanese maki. The original Panizza trumps any copycats — Chef Chris has perfected the crust and toppings to match the veggies. The rest of the afternoon was spent trying out various water sport activities available in Subic Bay. We rode (and tumbled down) the banana boat, zoomed around on a jet ski, and some even paddled of on a kayak. 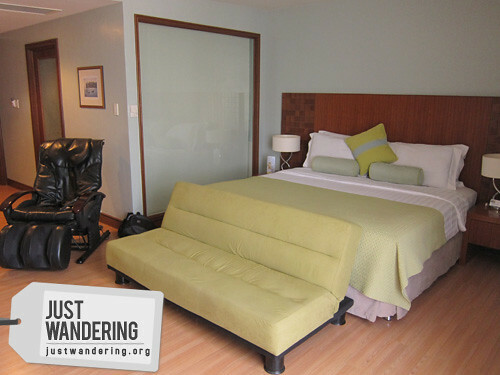 This is the second time Lakbay Norte came to The Lighthouse Marina in Subic Bay, but this time, we stayed for the night. We had more time to enjoy Lighthouse this year — we swam in the pool, had dinner and breakfast at the Sands restaurant and even beers and cocktails at the 720 bar. What I loved best about our stay was our room. It was done in soothing tones of blues and greens and spacious enough for a group of 4. It had the usual hotel room features (cable TV, minibar, personal safe, desk, etc) but with two interesting addition: a sofa bed and a massage chair. The bathroom also had its share of interesting feature: a glass wall facing the bed. I suppose it’s so you can look out the room window, but luckily it comes with a shade that conceals bathroom activities not meant for public viewing. Other features of the room include a small balcony and a separate shower stall (perfect for those of who don’t like clambering into the tub for a shower). What made our stay at Lighthouse memorable though, was Taboo. Lighthouse has a collection of board games that hotel guests can borrow. My roommates borrowed a couple of games, and they were right in the middle of a race to 30 points when I came back in the room. It was great way to pass the time and get to know the other participants of the tour. parang ang sarap ng panizza Japanese maki! Masarap siya talaga! I tried similar pizzas in Manila, ang layo! Iba talaga yung orig! i like the room, pero yung flooring, parang hindi match.. sana hindi wood yung theme..
@Nina: Oooh, eto pala yung orig ah. Masubukan nga. @Estan: Lazy boy naman yata. Hahaha. My gosh, that pizza is killing me right now. Late night cravings are not good! And that’s how you eat Panizza. Ang sarap lang naman tingnan ng Panizza. Yum. That is one yummy looking pizza! Hi Nina! Your blog is fantastic. By the way, where exactly is C’ Italian? The panizza looks interesting. I’m a sucker when it comes to Italian food. I live just a few kilometers away from Angeles.